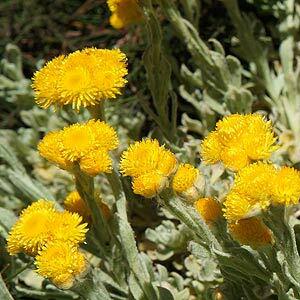 Chrsyocephalum apiculatum is often referred to as ‘yellow buttons’ or ‘common everlasting’. A tough plant from areas such as the Yorke Peninsula and other areas, this is a low growing evergreen perennial. As with many plants that grow over a wide areas, a number of different forms are available, the main difference seeming to be in height. Silvery grey green foliage buttery yellow flowers that are tightly held on tallish stems. Chrsyocephalum grow over a large part of Australia and good drainage would seem to be important. Chrsyocephalum apiculatum (formerly known as Helichrysum) grows to about .5m, has a low water requirement and seems to tolerate frost. A fast growing plant that will spread to around 1m, the long lasting flowers make it a welcome addition to the garden border. It does grow well in near coastal conditions and is very low care. Excellent in a low water garden. Fits is well to cottage garden styles with other drought tolerant perennial plants. Best in Full sun, although will grow in part shade. Pruning is generally not required although some gardeners do like to cut back spent flower heads to give the plant a tidy up. Fertiliser is generally not required and if you must, use a specialist native plant fertiliser which will be low phosphate. Chrsyocephalum ramosissimum is a low growing form.